Since 1st November 2008, Stars have been awarded each month for members who take part in Club activities. These awards are shown for each member in the List of Full Members. The Stars scheme has been a success, in that it has resulted in more movements per month. 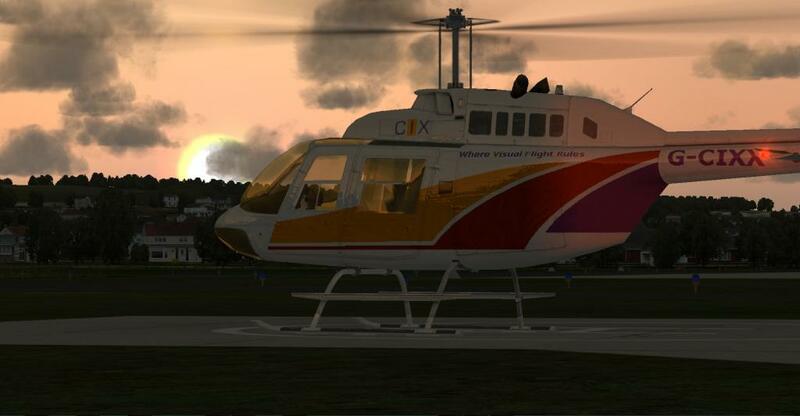 With appropriately designed events, we encourage more Club traffic, and more members flying together. The club has selected three Base Airfields at which ATC cover is regularly provided particularly on the assigned club nights. Most controllers who provide this cover are also club members, and are often available on the club TeamSpeak facility to assist when needed. Some planned activities taking in Base Airfields are advertised in the club forum each week. Every three months the Events Manager nominates a new "Roving Base" airfield at which ATC cover is frequently provided. This counts the same as a Base Airfield. Until December 2014, every month, the Events Manager published a number of Guest Airfields for members to visit during the month. From January 2015, every month, two groups of Farm Strips will be assigned following the route described under Operations on the Farm Strips page. Details of our assigned Base Airfields and Farm Strips can be found under Operations on the Locations page. Events organised by the Club, usually with briefings published on the web site, are called Star Events, for the simple reason that members taking part in them on the published date will be awarded a Star. Event details can be found under Operations on the Events page. Flights and tours organised informally by members among themselves may be endorsed as Club Events, provided that they are advertised on the forum, and at least three members agree to take part. However, unless they are managed by the Club Events Manager and re-designated as Star Events, they will not attract a Star. Where two members link their computers together while running Flight Simulator, with one connected to VATSIM, and either able to take control of the aircraft they are flying. Only flights for which members have submitted a PIREP (Pilot's Report) will be eligible for the award of a Star. This is because it is the PIREP data which is analysed automatically to award Stars each month. The club has its own flight logger, which can be used to record details of a flight and to submit a PIREP. A Star will be awarded to any member flying to or from one of our Base Airfields, or flying circuits at one of the Base Airfields. Only one Star can be awarded for each Base Airfield to each member per month, no matter how often the member flies to or from that airfield. This also applies to the nominated Roving Base airfield. A Star will be awarded for taking part in a Star Event, as long as the flight is made on the published date(s) for the Event. This rule is designed to encourage more members to fly at the same time, increasing the enjoyment and companionship. A Star Event involving one of the Club Bases may attract two Stars, one for the Event and a one for the Base, provided that only one Star is awarded per month for each base. If the event consists of more than one flight, the award will be made for completing one or more of the flights included in the event. These "qualifying flights" are selected at random by the Events Manager, and not disclosed to Members. To gain a star, therefore, Members need to either complete the whole event, or try and guess which flights are the qualifying ones. Naturally, the former is much easier and is in keeping with the spirit of Club flying. Until December 2014, a Star was awarded for flying to a Guest Airfield, regardless of the departure airfield. A star will be awarded for completing each assigned group of Farm Strips as defined in the club forum. When two members fly a Star Event in shared cockpit mode, such that only a single flight is recorded by VATSIM, each member can complete a PIREP provided that each has been in control for part of the flight. In this case they should each record only the amount of time they were in control. This applies whenever two members share a flight. In the case of a training flight with a Qualified Flying Instructor (QFI) and a trainee pilot, the QFI should record the whole flight, because he is responsible for the success of the flight. The trainee should book only the time he had control. Stars will be awarded on a calendar monthly basis. Members will quickly realise that, in a normal month with one Star Event, three Base Airfields, a Roving Base, and two Farm Strip groups, a maximum of seven Stars may be earned by each member during each month. Stars are accumulated, and a rolling twelve month total is displayed on the Membership List page along with the previous month's total. Sometimes, for reasons outside a member's control, a flight cannot be completed online, such as when the software misbehaves. In such cases, the Membership Secretary, at his sole discretion, may permit entry of an additional PIREP to secure the award. This applies in particular but not exclusively where there is strong evidence from other members, or VATSIM records, that the flight took place.